How does a new business establish an online presence at its early stage, to showcase creativity, but also leave room for future growth? To market her new start-up, Heather Jeffrey (industrial designer and founder of Re4m) has already been maintaining a successful social media presence, but she needed to refresh the hub of its online presence. Re4m is a recycling solution and interior design service, that custom-makes creative and beautiful furnishings for Ottawa’s local businesses. I worked with her on the business story, web content structure, and website visuals in 2016. The website has since been updated and kept fresh by Heather. On top of that, the experience of the site needs to match the style/tone of the business. 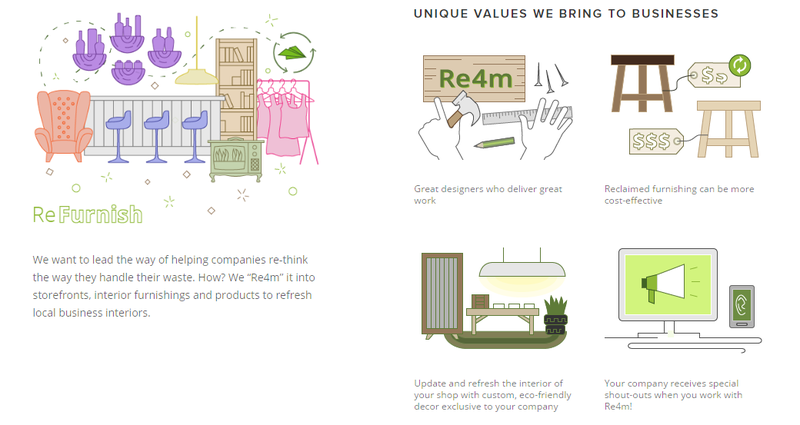 The central design idea for Re4m's website is to impress potential clients with Heather's creative ability to manipulate reclaimed materials, by explaining her refreshing service design of the up-cycling process, and showcasing the breadths of her interior design work. I also designed a down-to-earth tone for the website by crafting the visual design and copy writing. Home/Landing page - In one scroll, user gets a full idea of what this business is about. It features illustrations about the service process, value propositions, and achievements so far. With the lack of projects to show at the time, we thought we’d flesh things out with illustrations until the business finds its footing. Portfolio/Works - User can select filter for a wide range of projects, based on the sector they are interested in. This part will grow as the business progresses. We craft messages and contents that spark interests in target market of local retail businesses. About - Use can look for more detailed information once they arrive from the landing page. It tells the business story, its process, and its impact on the community. News - User can follow any new movement of the company and their work. Heather keeps her social media updated with projects in progress. 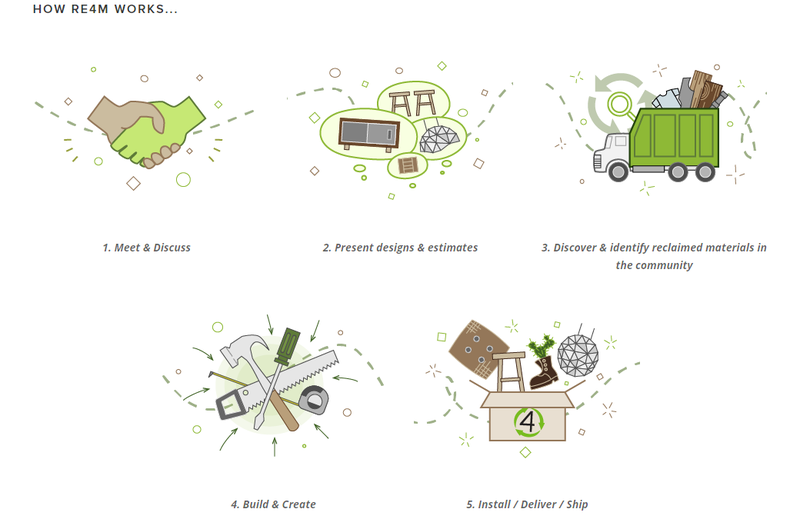 I illustrated the value proposition, process of the service, business impact, and scene of Re4m’s old shipping container workshop. To achieve a natural feeling with the color palette, I used a combination of olive, forest, lime green, and some brown and grey earth tone.